What DOES the Bible say about things scientific? Has science demolished belief in the God of the Bible? This book presents an important message for every senior high school or university student, whether they are studying science or not. Written in an easy-to-read style, it clearly explains what the Bible says about things related to the scientific world, and how the Bible laid the philosophical and ethical foundations for modern science. It shows that real science does not oppose the Bible, but rather an ideology that has matter and science at its centre. This book affirms the conviction that belief in the God of the Bible and faith in Jesus Christ has led to the flourishing of humanity in the modern world. "In this book John draws on his extensive experience as a teacher to package complex concepts into an easy read. This book is perfect for the average person or student who questions or has an interest in science and God." "John Norsworthy's love for science and God's Word comes through on every page of Why Science Matters. 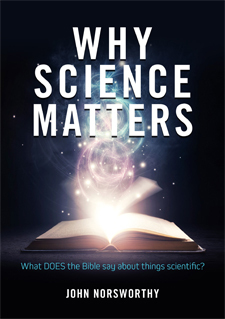 This is a resource that will benefit every Christian educator and anyone struggling to reconcile whether science and the Bible are compatible." John Norsworthy has taught in secondary and primary schools, and in the tertiary sector, Bible colleges and teacher education for over 45 years and is a board member for Thinking Matters NZ. He has served on curriculum committees and professional development in both the state and Christian sectors and served as secretary to the NZ Association for Christian Schools for twenty years. He currently is an adjunct lecturer at Faith Bible College, NZ and is passionate about the influence of the biblical revelation on all areas of human life. Copyright © 2018 Castle Publishing Ltd.